1/8000 to 30 sec, bulb, X-sync at 1/250 sec. The Nikon D700 is a professional-grade full-frame digital single-lens reflex camera introduced by the Nikon Corporation in July 2008 and manufactured in Japan. It uses the same 12.1-megapixel "FX" CMOS image sensor as the Nikon D3, and is Nikon's second full-frame digital SLR camera. The D700's full-frame sensor allows the use of F-mount (FX) lenses to their fullest advantage, with almost no crop factor. When a cropped DX lens is mounted on the D700, either the DX-sized portion, or the (vignetted) FX-sized portion of the camera's sensor can be used. The D700 has a built in autofocus motor for all Nikon autofocus-lenses, includes CPU and metering for older Nikon F-mount AI/AI-S lenses, and supports PC-E lenses. 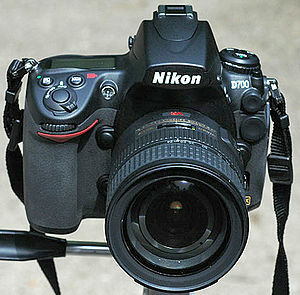 The D700 bears a physical similarity to the Nikon D300, which uses the same MB-D10 battery pack and EN-EL3e battery. As of 2012, the Nikon D3X, the D3/D3s, D4 and D700 were the only Nikon DSLR models manufactured in Japan. It was discontinued on August 24, 2012. The Nikon D700 has been tested by many independent reviewers and has generally received high marks. It achieved a top ranking in the DxOmark Sensor ranking and was, as of November 2011, ranked ninth behind the Nikon D3, Nikon D3S, Nikon D3X, four medium format cameras and the APS-C sized Pentax K-5. The camera received several awards, including a Digital Photography Review "Highly Recommended" award. ^ "THE AGILE NEW NIKON D700 FX-FORMAT D-SLR CAMERA DELIVERS PERFORMANCE INSPIRED BY THE NIKON D3 IN A SMALLER, LIGHTER DESIGN". nikonusa.com. Retrieved 2018-02-17. ^ Rockwell, Ken. "Nikon Lens Compatibility". Kenrockwell.com. Retrieved 2009-12-16. ^ Rockwell, Ken (April 2008). "Nikon 24mm PC-E Compatibility". Kenrockwell.com. Retrieved 2009-12-16. ^ "Nikon D700 – Digital Camera Reviews". Digital Camera Tracker. September 22, 2009. Retrieved 2009-12-16. ^ "Nikon D700". Dcviews. Retrieved 2009-12-16. ^ Burian, Peter K. (May 5, 2009). "NIKON D700 Review: Field Test Report". Photocrati. Retrieved 2009-12-16. ^ "Camera Ratings". DXO Mark. Retrieved 2011-11-13. ^ "Digital Photography Review "Highly Recommended"". Dpreview.com. Retrieved 2011-11-20. Wikimedia Commons has media related to Nikon D700 and Taken with Nikon D700. This page was last edited on 21 March 2019, at 06:07 (UTC).